When we last left our hero he (I) had just spent $110 for 2 Lilly Belle tickets. Another funny thing about this is that you cab write in how many people are in your party on the ticket so I really only needed one. Like I said though, I thought they were only $5 so why not buy 2? Fast forward to September 2010 and I bring my Lilly Belle ticket to City Hall to see if I can actually use it to ride in the private train car. Now, I thought they would just sign it and I'd be on my way. Even if you have a ticket and the Lilly Belle is running you have to set up a time to ride it. A Cast Member had to call the station and set up a time when an extra Engineer/Conductor would be available to ride with me and my family. Luckily my tickets were good, she filled them out and all I had to do now was wait until my designated time. 4:00 finally came around and it was time for our ride. Here is what the Lilly Belle looks like from the outside. 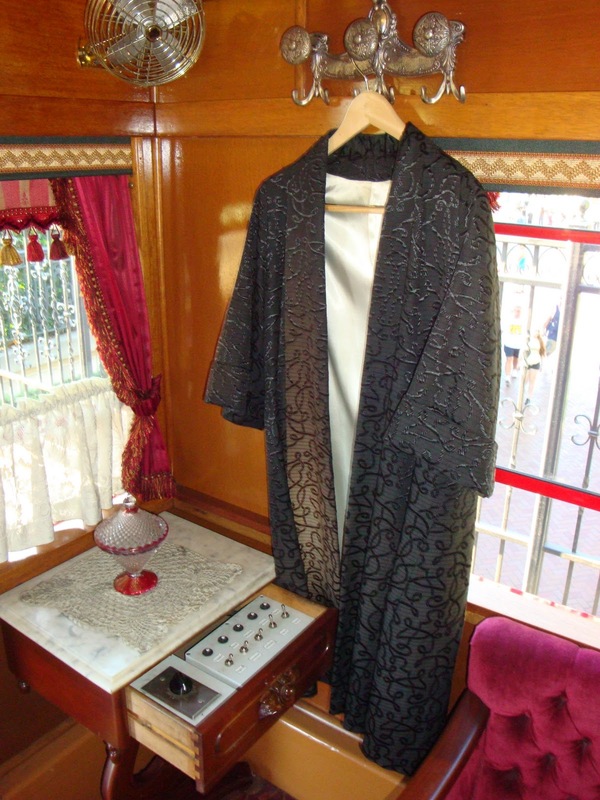 I always heard that the inside of the Lilly Belle was furnished with things from Walt's apartment. Our Cast Member told us that the chair (at the bottom left) and the carpet were the only things he had heard came from Walt's apartment. Let's take a look at this picture from National Geographic of Walt in his apartment. 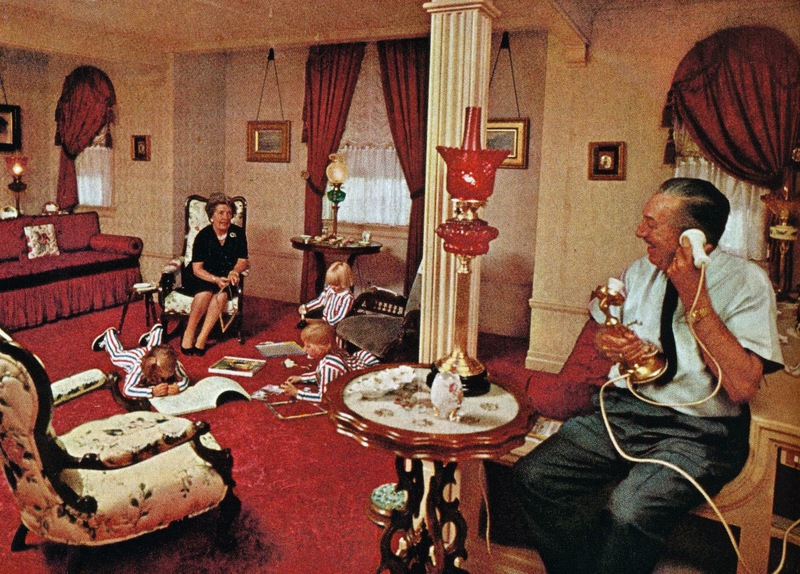 Maybe Walt had the carpet replaced after this picture was taken...? Maybe he purchased the chair after this picture was taken...? Here's a few more pictures of random things inside. We decided this was a shade placed in front of the window to block the sun. 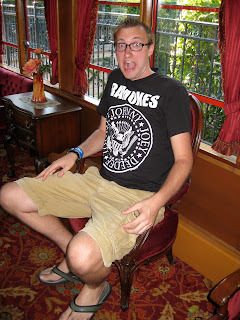 Even though it may or may not be Walt's chair I still had to sit in it. What a break! It's been so long kids. Let's do this! 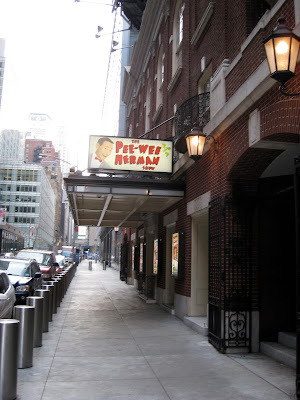 I flew to New York over the break to see the Pee-wee Herman Show and it was amazing! The show ended January 2nd but not to worry (if you missed it) because HBO is taping it later this week and will be airing it soon! The show was great, he took his original stage show from the 80's and added all characters from Pee-wee's playhouse (well most of them, sorry Floory fans). The show was at the Stephen Sondheim Theater, half a block away from Times Square. I went to the theater early to take some pictures and to find the stage door so I could wait after the show to meet Pee-wee. I had my girlfriend ask the box office if they had any sort of "meet and greet" opportunities available. The guy looked at us like we asked if we could kill his dog. He snootily told us he did not even know what a meet and greet was (obviously the name implies nothing). I decided to take my chance at the stage door after the show. After the show we ran to the door where a barricade was already set up. After a couple minutes he came out. He spoke for a few minutes thanking everyone for coming to the show and for waiting to see him after. Then he started taking questions from the crowd. The first was a girl in her 20's with a Pee-wee doll. She asked if he would sign it. Pee-wee told her he could not because it would not be fair for everyone else who wanted a signature because he could not stay out all night signing everything. He broke this rule though for a 7 year old girl who kept screaming "PEE-WEE!!!!" When he invited her inside to take a picture and get his autograph you could feel hatred from all the late 20's and early 30's kids crowd who had grown up with Pee-wee. Watching this kid get an autograph she would probably lose in the next few days was a little hard, luckily she was a really cute kid. When Pee-wee left so did most of the crowd. It went from over a hundred to about 15 of us. As we waited the cast started coming out and I had them sign my Pee-wee Herman Show poster. After over an hour of waiting (in 30 degree weather) security came and took down the barricade, it was not looking good. Then a few minutes later Miss Yvonne (from the original stage show and play house TV show) came out. She was nice enough to sign stuff for the 8 of us still waiting even though there was a car waiting to pick her up. The group dropped down to four, I couldn't even feel my toes anymore when a woman came out of the stage door. "Who are you waiting for?" she asked. One of the guys told her Pee-wee. She told us he had left half an hour ago. He must have left through a different exit. It had been almost 2 hours and I did not meet Pee-wee. This was the scene at the stage door when myself and the other 3 finally left. We left New York and headed to my girlfriends parents house in New Hampshire. There I wrote a letter to Pee-wee and sent along my playbill from the show. I asked him to sign it, I'll keep you posted on how that turns out. Even though I did not get to meet him it was a great experience and I cannot wait for the HBO special! And if your one of those Pee-wee haters out there you might be interested to know that Prince was in the audience the night I was there. How awesome is that!? he played at Madison Square Garden the night before and stuck around to see Pee-wee.